Becoming a rider in Around the Pearl is a life-altering ride. For many, it may start off as a means to discover the coastal belt surrounding the island of Sri Lanka, in a way you never imagined. For others, it might be a fun way to do something good with like-minded individuals and your friends. But at the heart of this is one cause, and that is Cerebral Palsy, and giving the 10,000+ children affected with this disorder, a way to integrate into society by use of a pediatric wheelchair specifically designed for this purpose. To become a rider, you must have adequate training and preparation for long distance cycling, a suitable road and mountain bike (could be rented), a clean bill of health and personal insurance cover. So get ready to take on Around the Pearl by filling out the registration form and you will be one step away from changing a life forever. Cerebral palsy is the term used for a group of non-progressive disorders of movement and posture caused by damage to motor control centers of the brain, and is Sri Lanka’s most common childhood disability, with an estimated 10,000 children with Cerebral Palsy. Many of these children go through life without the means to integrate into society. However, with a specialized wheelchair, integration through enhanced mobility is possible. A wheelchair costs $100 or LKR 17,000. You can donate to this cause through a variety of means. Click the ‘Register’ button on this website. This could be handed over to Naomi at Capital Alliance Limited. No matter your means of becoming a donor to this cause, all donors will be issued with an official receipt. Please note, if you wish to do sponsor a rider, you may mention the name of a particular rider while making your donations and write a cheque or fund transfer for the below details. 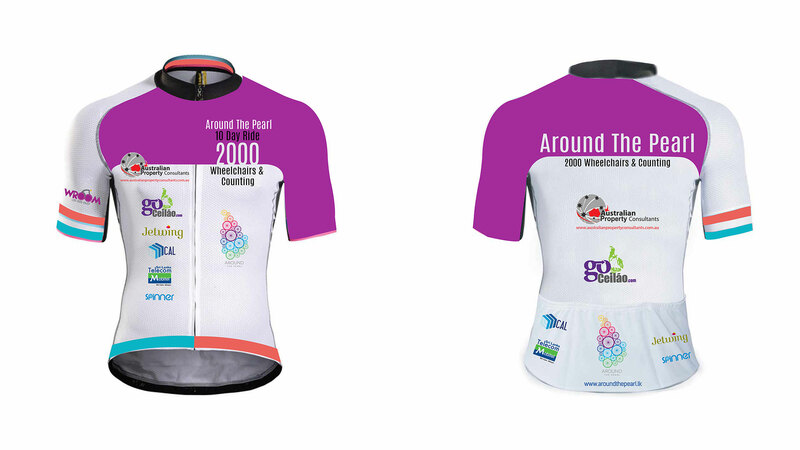 Around The Pearl is an initiative which exhibits the seamless synergy of like-minded individuals coming together to make a positive change in the lives of children. Around the Pearl 2019 will embrace the social media and digital realm, which has transformed engagement and volunteerism so profoundly. This is driven by individuals forming and communicating opinions and emotion, and is now open to all who wish to contribute to this momentous cause. The power and possibility of ambition, skill and ingenuity is a transforming realization for participants and audiences alike. Around the Pearl 2019 will be a revolution of self, and we invite you to be a part of it.